One of the most visually appealing muscle groups is the deltoids or shoulder. When fully developed the shoulders add width to your upper body and create the v-taper of the body down to your waistline. The shoulder is split into three parts: the front, side and rear deltoids. Training the shoulders is different to other parts of the body in some respect as there is more to it than just creating huge cannonball delts, there is also some priority to create proportion and symmetry in the shoulder muscles. Personally the effect on training shoulders is a different feeling to other parts of the body. I can hardly ever achieve a pump or DOMS. For me the shoulders have always just felt sore and because of this it is a difficult muscle to learn about training from experience. To make sure you have all bases covered when you are working out your shoulders make sure to include these exercises. As always form is the most important part of any exercise. Shoulder presses begin at shoulder height with one dumbbell in each hand and then lifted over your head and touch them together and then lower them again. Dumbbell shoulder pressing adds more range to the movement than with a barbell although both are fine to do. Keep in mind not all the shoulder muscles are being used only the front and side are being actively worked in this movement. This is why variety is especially important in a shoulder routine. Similar to the dumbbell shoulder press all three of these are the same movement in a slightly different way. They are however performed with a barbell. Any press is done with the hands wide on a barbell held slightly above the chest and then raised over the head to full extension and down again. The military press is performed sitting down, the machine press done either on a specific machine or smith machine and the push press is done standing up. The push press is good to use to add in extra reps as you can use the bounce off your legs to add momentum to the lift. All the press exercises again work only the front and side deltoids. A simple exercise to build size for the front deltoid. Holding the dumbbell raise one arm from the waist at the front of your body and raise is over your head whilst keep the elbow locked out or slightly bent. This will give a nice pump and very sore feeling immediately afterwards. The idea here is to build the side delt which gives the rounded look to a shoulder. With a dumbbell held in one arm at the side of the body raise it in a wide arc to above shoulder height and back down. This can be done seated or standing; the seated position adds stability to the movement and reduces cheating. For the cable movement it can be done across the body as if you were drawing a sword. You might have noticed a neglect of the rear deltoid muscle in this article. Being creative in working your rear delt is a good idea as there are limited options so find the exercise that works for you. One of the biggest mistakes you can make when building up shoulder size is to put little priority into the rear delt. Doing few sets at the end of the workout is a bad idea as it likely be out of proportion with the rest of your shoulder. Starting your shoulder routine with rear delt exercises is a good idea to ensure they receive a good workout. This can be done seated or standing and involves bending over close to a ninety degree angle. Holding the cables or dumbbells in each hand at the same time raise the weights from a relaxed position out the side in an arc motion. The movement resembles a reverse dumbbell fly and really works the rear delt hard. With the cable exercise have the cables crossed in the starting position and maintain a straight arm to ensure emphasis on the rear delt. 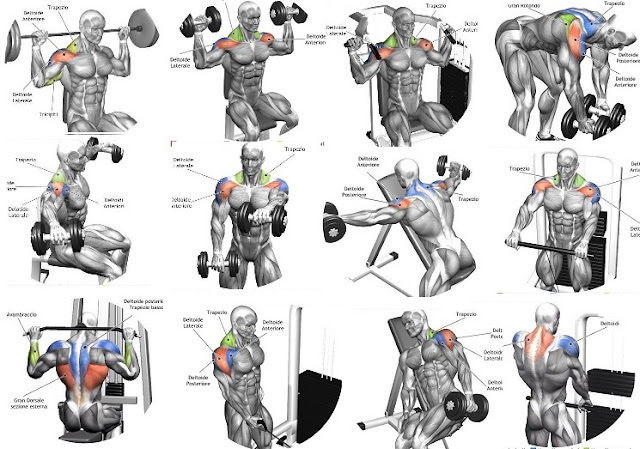 There you have a number of shoulder exercises to get you going in the gym. Remember though when it comes to shoulder training mixing it up, form and ensuring you hit all parts of the deltoid muscles is important.